As the Michi-no Eki we have picked up today is very much focused on flowers, let us write about the similar events we find all over the world that are relevant to flowers first. We believe that flowers are surely one of the best choices for presents. 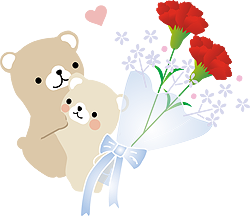 In Japan, there is a custom of sending a bunch of carnations to mothers on Mother’s day, which is the second Sunday of May. The custom of celebrating Mother’s day was brought into Japan from USA, where Anna JavisW established it in 1908 to honor all mothers and motherhood, later in 1914, the President Woodrow Wilson proclaimed it as a national holiday. The flower of Mother’s day was chosen to be a white carnation. Its whiteness is to symbolize the truth, purity and broad-charity of mother love; its fragrance, her memory, and her prayers. The carnation does not drop its petals, but hugs them to its heart as it dies, and so, too, mothers hug their children to their hearts, their mother love never dying. When I selected this flower, I was remembering my mother’s bed of white pinks. However, the original story is quite easy to be forgotten, we tend to give our mothers a bunch of carnations in any colours. Typical ‘Mother(s Day’ image in Japan, usually with carnations. If we observe other countries in the world, we found many different customs in which different flowers are given. Australia : Celebrated on second Sunday of May with chrysanthemums. ** Cf : In Japan, chrysanthemum is the flower for deceased people…. Italy : Celebrated on second Sunday of May with azaleas. ** Cf : Recently AIRC – Associazione Italiana per la Ricerca sul Cancro (Italian Association for the Research of Cancer) chose azalea for the flower for Mother’s Day as the symbol of the research of cancer and they sell them in some of the major parks all over in Italy. ** Interesting Event : Children pick anemones in a garden or in a forest, taking a present and picked anemones with breakfast to their mother who is still in bed. Thailand : Celebrated on 12 August (Birthday of Queen consort of Thailand, SirikitW). The traditional flower on this day is the jasmine. ** Interesting event : Everybody dresses in light blue to express his respect and gratitude to the Queen. Father’s Day was founded in USA by Sonora Smart DoddW of YMCAW in 1910, whose single-parent father raised six children. After hearing a sermon about Jarvis’ Mother’s Day in 1909, she told her pastor that there should also be Father’s Day as well as Mother’s Day. She initially suggested June 5, because it was her father’s birthday, but since the pastors did not have enough time to prepare their sermons, the celebration was deferred to the third Sunday of June! The tea of the second brewing is always less delicious compared to the first brew. Father’s Day was led by the trade groups which most benefit from Father’s Day, such as manufacturers of ties, tobacco pipes, and other traditional present appropriate for fathers. Rose was chosen for the flower of Father’s Day because it was regarded as the king of all flowers. Wikipedia will tell you that there are wider varieties of days on which Father’s Day is celebrated in the world. In Japan, like USA, the founder country, Father’s Day is the third Sunday of June. Unfortunately, We could not find much information on Father’s Day flowers in other countries. It would be nice if you could give us information on Father’s Day flowers in your country which we could write on, correlating to Japanese customs near future! As many of you may know, Japan has tradition of IkebanaW, which started in 15th century by Senkei Ikenobo, a monk of Rokkaku-dōW Temple in Kyoto. Today, we could find more than 40 schools (groups) and individual artists of different Ikebana styles. There is also a tradition of world famous BonsaiW, which should give you an image that Japan indeed is one of the major flower producing countries in the world. 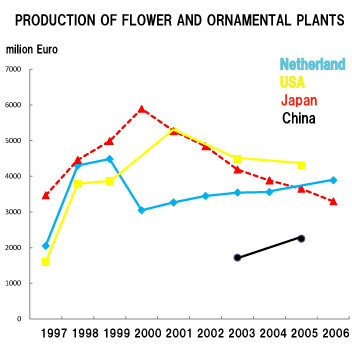 While, this is the data on how much the Japanese purchased flowers in 2006. If you look at this data, you will see the fact that Japan is not a loving flower nation any more, the fact that we would like to deny. 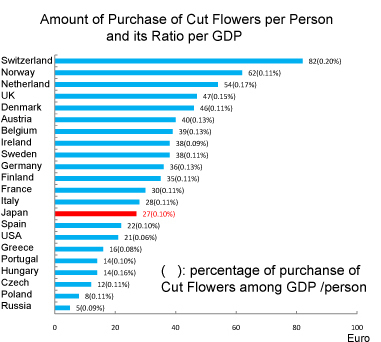 The amount spent on flowers per person in Japan is around one third of the people in Switzerland. This shows that only 40% of the Japanese purchased flowers more than once a year, which may be because there are many flowers in the nature but pity if flowers were not chosen as presents. And mind you, Japanese women as well as women in other countries love receiving flowers from their boyfriends or husbands!! A courtesan arranging iris in the vase. 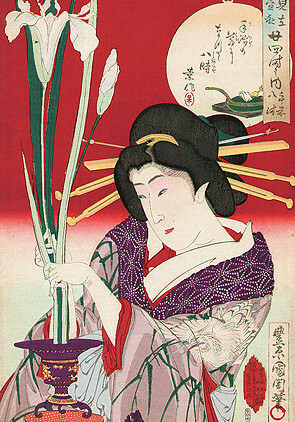 UkiyoeW by Kunichika Toyohara, late Edo to early Meiji period. Chiba is the second best producing prefecture of cut flowers (in 2007), following Aichi prefectureW. Especially, in southern part of Chiba, in Boso Peninsula whose climate is temperate, floriculture is very active from January to March. It is the largest producer of stock flowers, pot marigoldW and lilies in Japan. If more people go to Chiba and learn how to admire flowers at home (not only cherry blossoms in the park), the situation of Japan would certainly change. 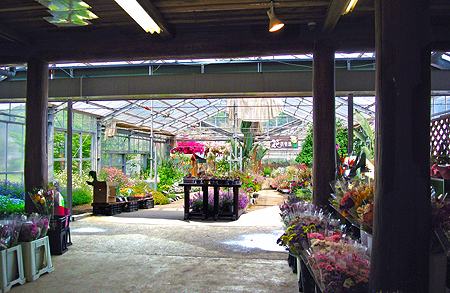 There are various sites in Chiba where you can have a relaxing moment with flowers and among them is the very unique Michi-no-Eki specialized in flowers, Michi-no-Eki ‘Ohtsu-no-Sato’. One of the largest greenhouse in Japan measuring 13,200 square meters exists with many kinds of flowers of the seasons including rare varieties as Aloe StriataWs and StrelitziaWs. Various cut-flowers are sold inside the side. You could also pick grown fresh flowers for yourselves! If you are living in Japan or staying for quite a while in a plain hotel room, it would be one of your choices to decorate your room with some of these beautiful flowers to lighten up. Here, in this Michi-no-Eki Otsu-no-Sato, you can pick any flowers you want within the site and bring them back home with you with incredibly decent price from mid October to May. Moreover, there is a flower shop where local farmers deliver the cut-flowers and pot planted flowers which also could be bought, easy on your pocketbook. You can also send the flowers from here, to your friends by post. 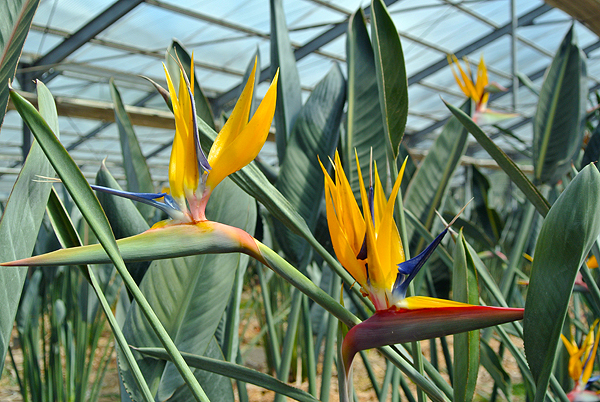 Strelitzia, one of the gorgeous flowers the area produces. In summer time after the flower season, you can enjoy picking fruits and vegetables such as Biwa (loquatW), blueberries, melons, grapes, tomatoes, and goya bitter melon in their greenhouse. Like other Michi-no-Eki, there is a cafeteria where you can feed yourselves with dishes cooked with locally grown vegetables and deserts of local fruits. At the very end of Tateyama Expressway, it will instantly lead you to Tateyama Bypass. Take Tateyama Bypass and Prefectural Road 185, turning left at Fukuzawa / 福沢 intersection, where you will find a signboard of Michi-no-Eki (Road Station). The road is quite narrow but you can reach the destination easily by following the signboard. 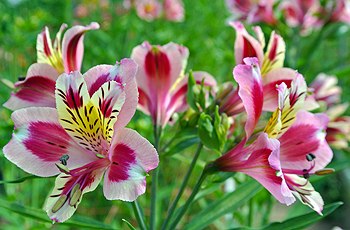 Varuous types of Alstroemeria can be seen here in various colours. 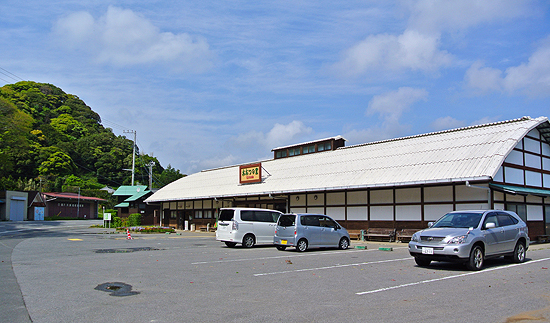 Address : 320 Ootsu, Tomiura-cho, Minami-boso-shi, CHIBA Pref.